This afternoon, we saw more of London than we bargained for. Our goal for the assignment was to visit the Kensington High Street (KHS) Tube stop; our navigational skills are clearly wanting at this stage in the game, as an 8 mile round trip took nearly two hours. The following is a recap of our jet-lagged travels. We managed to go the wrong way out of the front door of the Arran House, as our goal was to take the Circle Line from the Euston Square stop to the KHS one. A genius plan, as we could cover the requirement to take a different route there and back by circumnavigating the Circle in opposite directions. Alas, that would have required making a left out of the Arran House. We made a right. We ended up stumbling on to the Tube at Tottenham Court Road, which could have been an only slightly shorter Tube trip. Fortunately, construction at the Bank stop thwarted our plans, and we took the Central Line all the way out to Liverpool Street before finally connecting to the Circle. Conservatively, this foray took 40 minutes. We took the simpler (and quicker) return path of the Circle back to Euston Square. 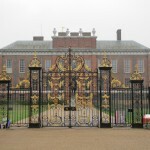 Unless it is indeed not as obvious as we think, the KHS station is named for the nearby Kensington Palace and Gardens. The Tube presumably stops there because the surrounding area is an upper class shopping district. The American supermarket Whole Foods, typically found in wealthier locales in the states, had a massive store right down the street from our stop. It is located in the Royal Borough of Kensington and Chelsea. 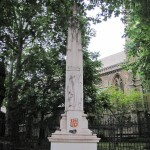 On our way to Kensington Palace, we stumbled upon a war monument dedicated to the men from Kensington who died in “The Great War.” The monument was situated just outside of an old church, St. Mary Abbotts. 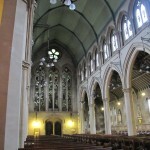 St. Mary is a Victorian building in the English Gothic revival style. (A church has been on that site since the 9th century.) Leaving, we got directions (albeit quite circuitous ones) to the palace from a church attendant. Our time was cut short in exploring the area around the palace and its gardens because of the rain. However, we did stumble upon the Romanian Embassy. Who was on the street? Well, in our brief and informal survey of the neighborhood, there were a lot of pigeons, haughty rich people, tourists, and improbably, two policemen armed with automatic weapons and sidearms. (They followed us for almost two blocks). The area of the neighborhood that we walked in was largely a upper-middle-class shopping district; residences were not readily noticeable. The architecture was an eclectic mix of what appeared to be Victorian-era buildings and more modern stereotypical shopping centers. Overall, it was quite an enjoyable adventure, despite the rain and the initial issues with the Tube.